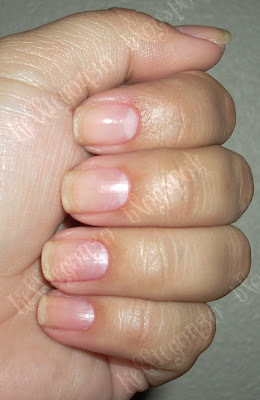 my bare nails (photographed a few days ago). they are pretty much the most perfect i could ever ask for them to be (minus the staining of course). not to blow my own skirt up or anything ;) i'm always diggin thru archives in other nail blogs looking for those elusive shots of their bare nails so i wanted to put mine out there front and center haha. i guess it's kind of like seeing me naked. i'm weird. my collection (minus a few i have added this week...oops!!). be sure to click to make this guy bigger, it looks ridiculously little on here. i just got some sterilite bins to store them in so phew my dresser top is not longer being held captive by these bad boys. i have at least three posts i have been too lazy to get up this week so here's looking at you kid, they'll be up soon! later lovelies!